For film actor and director Shashi Kapoor, a tribute to a legendary father, theatre personality and film actor Prithviraj Kapoor,�has to be an ongoing process. Not content with his Prithvi Theatre, in the northwestern Mumbai suburb Juhu, completing 25 uninterrupted 'performing' years, he now looks forward to getting his father's theatre company's scripts printed for the benefit of today's theatre-loving generation. "'They will be good quality stuff, but sold cheaply so that groups can buy them, read and discuss them, and use them for their workshops and rehearsals," he says. "I want the new generation to remember a little bit of my father's work and his integrity, especially in theatre," he says, his warm smile showcasing his genuine pride for a father who gave the Hindi (or should we say Indian) film and theatre industry numerous luminaries. Shashi Kapoor, along with his wife Jennifer (daughter of theatre personalities Geoffrey and Laura Kendal), founded Prithvi Theatre, Juhu, in 1978. Prithviraj Kapoor�passed away in 1972, and Shashi Kapoor felt there had to be some memorial in his name, to remember his love and work towards theatre. Top 5 - Preity Zinta! First look: Sanjay Dutt plays doctor! The couple started planning the drama hall in 1975, and their dreams bore fruit three years later when actors Naseeruddin Shah and Om Puri staged the first play. There has been no looking back since. When Jennifer passed away on September 7, 1982, their son Kunal took over the day-to-day running of the theatre. Daughter Sanjana has been handling the responsibility for many years now. Shashi Kapoor now wants to take the tribute forward, by getting his father's plays in print. "People know my father as an actor in the movies since the late 1920s. But he was also interested in theatre and wanted to have to his own theatrical company. He launched Prithvi Theatre [a drama company] in 1944. This went on till 1960. There were 150 people working with him. "He toured the entire country with his productions, even in places where he knew the audience would have problems understanding the [Hindi] language," he says. Prithvi Theatre's first play was the classic Shakuntala (1944), translated into Hindi�-- "not Hindustani" --�by Pandit Betaab, an "unusual writer with tremendous command over both the Urdu and Hindi languages." The company followed it up with seven original plays, written by playwrights employed with them. Shashi Kapoor remembers his father was adamant the company's plays should deal with current issues that concern the common man. "My father's basic request or dictum to the writers was to write plays that dealt with contemporary problems. Partition was about to happen and he wanted the anxieties of the people to be dealt with in their plays." 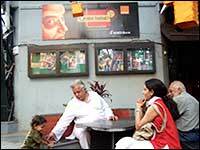 "The play Deewar, for example, predicted the Partition in 1945 and said in the end the split would fail. It was written by a then very young writer Inder Raaj Anand, who later on went to become a very big name in Hindi movies, both in Bombay and Madras. His son Tinnu Anand is in the movies today. "We had another play called Pathan. Our family came from the North West Frontier Province, which is now in Pakistan; at that time it was in undivided India. There was just one Pathan community then. There were no Hindu or Muslim Pathans. It was a wonderful community and the play was about their lives. "Aahuti, which means sacrifice, dealt with the refugee problem after the Partition in 1947-48. "Then there was Kalakaar, a play about a painter's experience with nature in the village and then in the city, which is all cement and concrete, and the people here, and what happens to him. "Gadaar, meaning traitor, was a play in Urdu, set in the period 1920 to 1947. The play dealt with a Muslim family in Lucknow, Uttar Pradesh, and had three acts in three periods. It was one of the best-written plays I have ever seen, dealing with the transition of the Congress, the Muslim League and the Partition and how the Muslim family goes through the period. "Paisa dealt with how a family persuades, convinces or should I say bullies a young man to compromise with his principles to earn money and how this good guy is tempted to become a banker, a rich guy, but dishonest. He loses his soul. "Kisaan was based on Mahatma Gandhi and Vinobha Bhave's philosophy about how farmers are the most important people in the country and how they should be given importance over all other problems. "These villagers are old fashioned and cannot accept modernity. They are not educated; they are superstitious; they do not understand the use of technology in their professions, and are frightened of tractors and other means of improving agriculture. "It was a very interesting play for which I did the production design. I was just 17-18 then [in 1956]. I had completed my education and was into my new training in drama with Prithvi Theatre Company. "I want to make all these scripts, which are the property of Prithvi Theatre, available for other groups. I am getting money arranged, not from the Prithvi Theatre [the drama hall] funds but from outside sources, to print them," he says. Does he have any plans to get these plays into production? "No, it's not economical. A rupee was worth more in those days. Even the highest paid actor would get Rs 900 per month. When I started, I was paid Rs 25 a month. When I got married in 1958, my wife and I were both working for Rs 200 each. "The company had 150 people, which included carpenters, painters, managers, booking people, technicians, 12 musicians, writers, actors etc. Today, we cannot afford to have that many people. And all our scripts require huge teams, including 30 or 40 actors. So staging them is not possible,'' he says. "Even people like Jabbar Patel who have staged Ghashiram Kotwal will find it difficult to stage such plays now. I wouldn't advice it. In those days, theatre rentals were low; production costs were cheaper. Now, one cannot break even. "So it's better to choose plays that need less number of actors, do a few shows and then move on to bigger things." But he is convinced printing the scripts will help today's theatre groups. "I have not acted in Gadaar, but I was told to learn the parts and rehearse them thoroughly, to improve my Urdu diction. That was one of our courses then. These things don't happen now. People don't bother much about language and pronunciations in theatre anymore. "With this I hope to take my father's vision forward. He wanted to show the way to newcomers that he did not have. He struggled, but he did not want others to struggle similarly. He was laying a pagdandi, a path along untravelled areas. Bahut kaante nikal aaye humra manzil se." Who was Sri Shashi Kapoor's mother, wife of Sri Prithvi Kapoor?